How about some extra reading material? 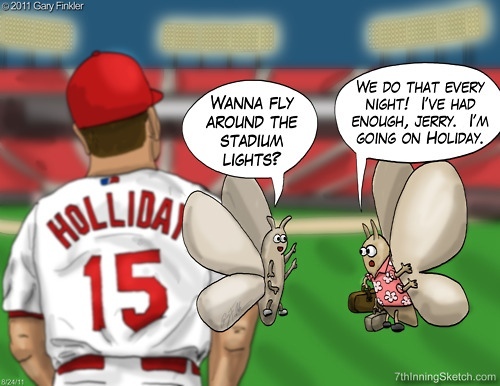 The Hardball Times’ Chris Jaffe has been doin’ work on the St. Louis and the Redbirds the last two weeks. First, a piece about the anniversary of the Eddie Gaedel game that includes a lot of Cardinal notes in the list below as well, including Harry Walker, Lindy McDaniel, Bob Gibson, and Jim Edmonds. Regarding Gaedel, I never knew Bill Veeck threatened him with a sniper. Hilarious. Jaffe follows that with an article about the debut of Mark McGwire for the A’s. As a third baseman. Heh. As pointed out in the other anniversaries, it’s the same day Mac hit one of his 500+ foot home runs in 1999. Continuing the anniversary posts, last week marked thirty years since Garry Templeton told the fans in St. Louis that they were number one. I still love watching the clip of Whitey Herzog yanking Templeton down the dugout steps. The last piece is the most fascinating to me, reviewing managerial matchups. Did you know Tony La Russa and Dusty Baker will manage their 200th game against each other this weekend? Tony’s been around a loooong time. Want to read a review of the home park? Stadium Journey has you covered. Find out what their correspondent thinks of Busch III. Previous post: But Puma, What About The Rangers?